Lions live in large social groups called “prides.” A pride can have 3 to 30 lions and is made up of lionesses (mothers, sisters and cousins), and their cubs, along with a few unrelated adult males. Unrelated males stay with the pride for a few months or a few years, while the older lionesses stay for life. Lionesses are more agile and faster than males. Hunting at dusk and dawn, lionesses work together to hunt and also help rear the cubs. Males patrol, mark and guard the pride’s territory. Males guard and take care of the cubs while lionesses are hunting. 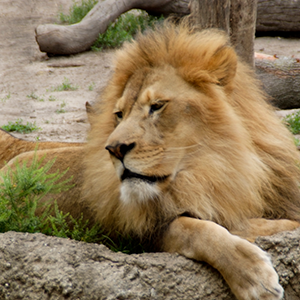 A lion’s life is filled with sleeping, napping and resting totaling up to 21 hours! Male lions are able to roar at about one-year old and females can roar a few months later.